No matter where you’re getting waxed, follow these simple tips to achieve the best results. Keep hair long enough for the wax to grip it. Too short & the wax can’t pick it up well enough to remove it; too long & it prevents the wax from adhering. Two to three weeks of growth (about an 1/8 to a 1/4 of an inch hair length) is ideal for waxing. Certain medications can sensitize skin to waxing. As wonderful as Retin-A creams are for skincare, they also leave skin more susceptible to injury during waxing. Hold off on retinol-based products for two weeks before waxing. Gently exfoliate your skin a day or two before waxing, but skip harsh scrubs on the day of your waxing appointment. Exfoliation helps wax grab hair & not skin, but it can also leave skin more sensitive to pain, so lighter is better. Healthy, well-moisturized skin allows the wax to glide more easily. Too much moisturizer could coat the hair & interfere with the wax’s grip, so make sure not to moisturize on the day of your waxing session. Make sure there’s no broken skin or inflammation on the day of your waxing appointment. 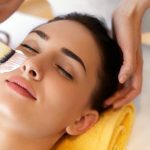 If you have moles or beauty marks, point them out to the esthetician so they can be protected during the waxing process. 5 Benefits of a Pumpkin Peel FOLLOW THESE 7 SIMPLE STEPS & KEEP YOUR SKIN SMOOTH!